Fly from Ohahu to Lihue, Kauai and enjoy a guided small-group tour of Kauai by land and helicopter. The land portion of your combination tour covers Kauai's most beautiful sites including Ahukini Landing, Lydgate Beach, Kilauea, Princeville, Kapa’a and Kealia Overlook. 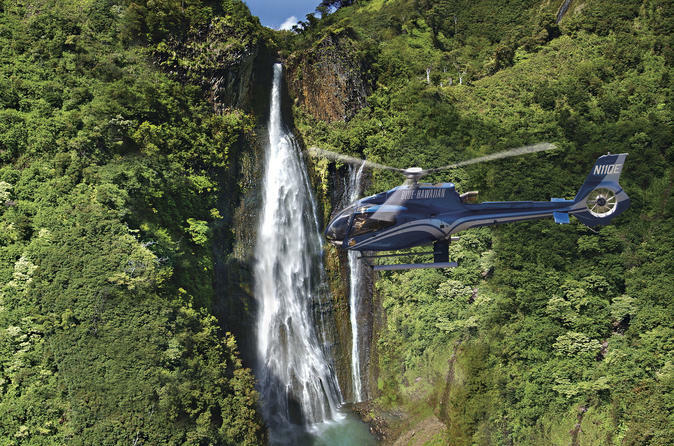 In the afternoon, take flight in a helicopter to enjoy aerial views of Hanapepe Valley, Waimea Canyon and Hanalei Bay. Your tour includes round-trip transportation from your centrally located Waikiki hotel and lunch at Tahiti Nui restaurant. Begin your day with pickup from your centrally located Waikiki hotel at approximately 5:00am. You may alternately meet at the airport at 5am. Take a short flight from Oahu to Lihue, Kauai to begin the guided land portion of your small-group tour. Catch a glimpse of the grand Opaeka'a Falls cascading into a hidden pool. Visit Kauai's most beautiful sites made popular by hit movies including Ahukini Landing (Donovan’s Reef), Lydgate Beach (Blue Hawaii), Kapa’a Town (Jurassic Park), Kealia Overlook (King Kong), Kalalea Mountain (Raiders of the Lost Ark) and Princeville (Lilo and Stitch). Enjoy lunch (included) at Tahiti Nui restaurant which was featured in the Oscar-nominated film, The Descendants. Choose from a cheeseburger, garden salad or a chicken or pork sandwich; lunch comes with unlimited soft drink refills. Next, stop in Hanalei for a view of the famous Hanalei Pier featured in Blue Hawaii. At 3:30pm, take a 50-55 minute helicopter tour featuring aerial views of the waterfalls and hidden beaches of the Napali Coast, Hanapepe Valley. Soar over the Waimea Canyon (the 'Grand Canyon of the Pacific') and see views of Hanalei Bay and Mt. Waialeale, the highest point on the island. You will be transferred back to your centrally located Waikiki hotel around 7 to 7:30pm at the conclusion of your tour.